Our HogWorkz King Tour Pack is the big daddy of tour packs! It's the quickest way of adding additional storage to your '97- Present Harley Touring! Gain tons of added storage for those helmets, jackets and whatever else you may need for those long journeys. 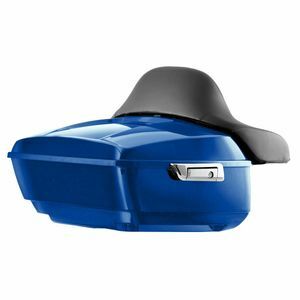 Painted Superior Blue to match OEM specifications and complete with full passenger backrest as well as triple chromed premium lid/latch & lock hardware! Installation of the King Tour Pack is quick and easy with our mounting bracket. Appropriate Docking Hardware Kit & Tour Pack Rack Mount required. Fits '97- Present Road King®, FLHT, FLHX, and FLTR models equipped with 2-up and solo seat and required docking hardware. Triple chromed premium lid, latch & lock hardware with keys! The roomiest tour pack offering on the market!